About Cheryl M. Message Cheryl M.
We have traveled all over Europe and our day in Amsterdam was fantastic because of our guide, Cheryl. Her knowledge and history of the City and the Country was excellent. There were so many local areas she took us through that we would never have found on our own. Her level of detail was exceptional; from a traditional lunch to ensuring we didn't leave anything behind on a tram ride through the city. A full day tour went by so fast, glad we took so many pictures to remember. Thank you, Cheryl, well done. Cheryl was great! We had a fantastic day in Amsterdam and got to see so much. Cheryl is knowledgeable, professional and provided us a great experience! Amsterdam is a beautiful city and she made sure we knew and saw SO MUCH! TOUR GUIDE RESPONSE: Thank you very much for your lovely review. Im glad you had a lovely day in Amsterdam. If you are ever back let me know. Cheryl was fantastic. She put together a tour just as we asked. We did two (2) separate half day tours. During the trip, she made it very clear the day was ours, and she wanted to make sure WE were the ones happy. Knowledge is off the charts, but a super easy personality makes is SO easy to be around. Cheryl is like a friend after 5 minutes. HIGHLY recommended. We loved our tour with Cheryl! She was very knowledgeable and personable. We learned so much about the Dutch culture spending the day with her! She picked us up and drove us to Aalsameer to see the flower auction, which is a must! We traveled onto Keukenhof gardens and although the weather wasn't perfect, we enjoyed the tulips and beauty of the gardens. She surprised us by taking us to De Zaanse where we saw clog making and plenty of windmills. We would highly recommend Cheryl for all tours of Amsterdam! First, Cheryl was recruited at the last minute to fill in for a guide who suffered an injury and had to cancel our original tour. That unfortunate situation could not have worked out better for us! Cheryl is a warm, friendly, walking encyclopedia of information on Amsterdam. Book her. You will be glad you did. TOUR GUIDE RESPONSE: I had a fab time showing you around Amsterdam. Thank you for a great day! Cheryl was wonderful. She took us all around Amsterdam and shared her knowledge of this wonderful city. seeing the Rembrants at the Reijksmuseum was breathtaking. We definitely want to come back again and hopefully get to go on another tour with Cheryl. TOUR GUIDE RESPONSE: It was an absolute pleasure showing you around Amsterdam. What a surprising adventure it was! TOUR GUIDE RESPONSE: It was great showing the group around Amsterdam. Thank you for giving me the opportunity to allow such a great group to experience all the city has to offer. Cheryl was the perfect tour guide with excellent knowledge and experience of the city. She arrived promptly at our rendezvous and immediately demonstrated her confident, informative and generous nature. Cheryl was pleasant and attentive at all times during the tour and was proactive in ensuring I had an enjoyable and memorable visit to Amsterdam. Importantly, Cheryl created an excellent impression to me of "Tours By Locals" and I will now be happy to use them on my next visit abroad. Thank you Cheryl. TOUR GUIDE RESPONSE: Hi Gareth, Thank you for asking me to show you around Amsterdam. It was an absolute pleasure and am happy it completed your trip. Cheryl was excellent. She was very informative and had a great deal of enthusiasm. Our tour provided us with insight into the everyday lives of the Dutch. I would highly recommend Cheryl to anyone intetested in experiencing the cultural aspect of Holland. TOUR GUIDE RESPONSE: Thank you so much. It was a pleasure taking you around Holland! Fantastic day. I think Cheryl even ordered the sunshine as it was the nicest day of our vacation. She was knowledgeable and a pleasure to talk to. She is a world traveler and obviously knew the type of day a fellow traveler would enjoy. We went to three locations and everything went smoothly. I was able to check off of my bucket list seeing the tulip fields. We would love to have a guide like her on all our vacations. Thanks to Cheryl for my favorite day in Holland. 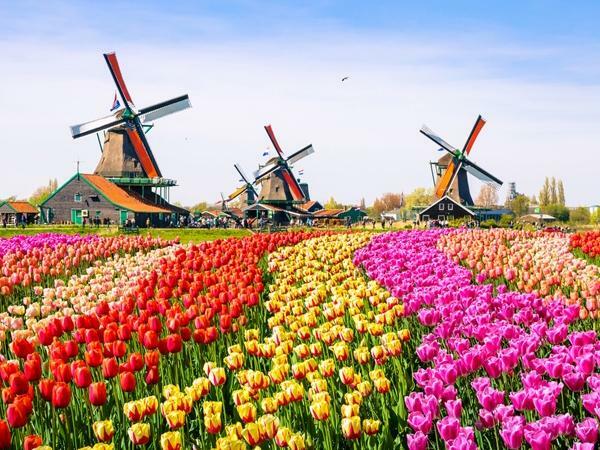 TOUR GUIDE RESPONSE: Debra it was a pleasure showing you around the Netherlands and having you check off an itrm of your bucket list. Thanks for a great day! TOUR GUIDE RESPONSE: Hi Craig, it was lovely to meet you and your wife and it was a pleasure to show you the lovely flower fields. Thank you for your kind review! TOUR GUIDE RESPONSE: Aydin it was a pleasure showing you around Holland during your photo holiday.I hope you got to make some excellent pictures. TOUR GUIDE RESPONSE: It was great meeting the group and keeping them entertained. I really had a great time with the group and answering their questions. Cheryl was an absolute delight in showing us around Amsterdam. She made sure that we saw all the sights we wanted to see and explained a lot of the history of the city. Cheryl was very organized and went the extra mile to get our skip the line tickets for Anne Frank tour given it was Sunday. She also prepaid for Van Gogh Museum. She is a great ambassador for the Amsterdam community as well. We would recommend her to anyone wanting a tour of this beautiful area. Roger & Nancy Elliott U. S. A. TOUR GUIDE RESPONSE: It was so nice meeting you both. Thank you for giving me the opportunity to show you around Amsterdam. I also had a wonderful afternoon with you and delighted that I was able to provide you with everything you were looking for in Amsterdam. I hope you enjoyed the rest of your stroopwafels. Cheryl was a pleasant tour guide and definitely complimented my day as I'm not always sure where to go and what to do. TOUR GUIDE RESPONSE: Glad you enjoyed the tour and that I was able to introduce you to the Dutch bitterballen.It was a shame the Anne Frank house was so busy but we made it up with the cheese experience!